These printable worksheets can be used to help your students learn to count by 9s. Count 9, 18, 36, 45, 54, 63, 72, 81, 90, and so on. On this skip-counting worksheet, count by 9s along the number line to find the missing numbers. Skip count by 9s on this space alien-themed worksheet page. Each penguin has a multiple of 9 written on its tummy. Can you fill in the missing numbers? Skip count by 9s. Write each number on a helium balloon. Students will fill out all the sections of the caterpillar as they skip count by 9s. Practice skip counting by 9s, then answer the word problems and questions that follow. Print out this worksheet so your students can practice skip counting by 9s. Practice counting by 2s, 3s, 4s, 5s, 6s, 7s, 8s, 10s, 11s, 12s, 25s, and 100s. 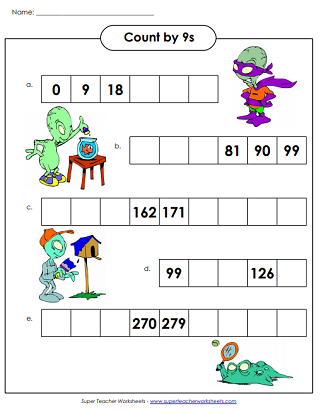 Super Teacher Worksheets has lots of worksheets for teaching simple multiplication facts.